Replace your overused or misplaced power cables. Universal Power Cords are designed to work with most PCs, monitors, scanners, printers and other devices that use the 3-pin shroud power connector. All Mii power cables feature a fully molded design that provides maximum durability and long-life usage. Stranded unshielded PC or monitor power cable. 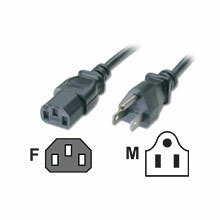 4 ft UNIVERSAL USA POWER CORD - 48"